Lowell Dwayne "Wayne" Reynolds, son of James Roy Reynolds and Twyla Fern Waugh Reynolds was born April 13, 1937 in Clarke County, Iowa and passed from this life Saturday, June 2, 2012 at VA Central Iowa Health Care System in Des Moines, Iowa at 75 years of age. Wayne received his education in the Clarke County schools and Osceola High School. He enlisted in the United States Navy and served from 1954 - 1958 as a Machinist's Mate 1st Class during the Korean Conflict serving aboard USS Skagit. He was united in marriage to Lucille Burrell on October 21, 1962 in Osceola, Iowa and one daughter blessed this union, Christy. Wayne and Lucille are lifetime residents of Clarke County where Wayne was a member of AmVets. 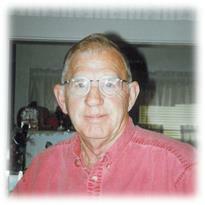 He was employed as a Maintenance supervisor for the Iowa DOT for twenty-nine years before retiring in 1998. Wayne and Lucille enjoyed camping with their friends and going to sales and auctions where they collected coins, clocks, paperweights and M&M memorabilia. Those relatives who preceded Wayne in death were his parents; mother and father-in-law; sister, Maude McKnight; brothers, Milton Reynolds and Gary Reynolds; brothers-in-law, Kenneth Lee, Leonard Woods, Gerald McKnight and Merrill Burrell; sisters-in-law, Joan Burrell and Eileen Reynolds. Wayne leaves to cherish his memory: wife, Lucille Reynolds of Osceola, IA, daughters, Christy (Marlan) Boor of Murray, IA and Liz (Jim) Blubaugh of Chariton, IA and their children Dillan and Jordan; brother, Keith Reynolds of Osceola, IA; sisters, Phyllis Lee of Des Moines, IA and Karen Woods of Des Moines, IA; brother-in-law, Carl Burrell of Des Moines, IA; sisters-in-law, Marjorie Reynolds of Osceola, IA, Donna (John) Carson of Woodburn, IA and Ann Burrell of Osceola, IA; many nieces, nephews, great nieces and, nephews, great-great nieces and nephews and a host of other relatives and many friends.